Every single person who is into the wraps industry and graphics market knows about the legendary “King Of The Wrap World Championship”. This is originally known as the “Wrap Like A King Challenge” by Avery Dennison Corporation of Graphics Solution that has taken place every year since 2013. In 2017, Nicky Caminiti from the Australian wraps team Exotic Graphix became the King Of The Wrap World as he and his team won the title. The “Wrap Like A King Challenge” is a modern competition for automobile wrap installers. Master wrappers from 53 countries all over the world participate in this competition to showcase their wrapped vehicles. 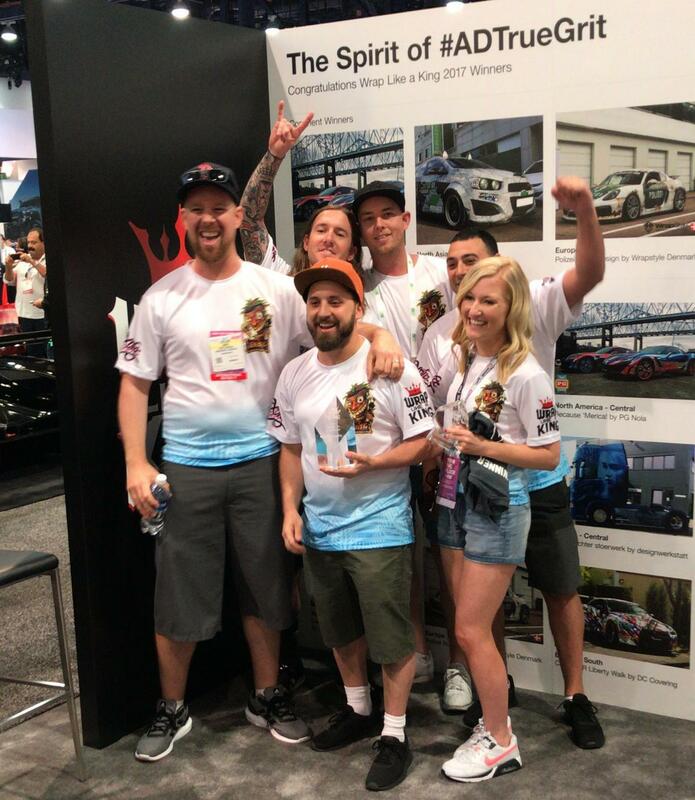 They present color changing and mercantile vehicle wrap proposals to the Avery Dennison Corporation to compete for the title of the “King Of The Wrap World” along with bragging rights and a cool $30,000 USD. The competition has three rounds. In the first round, selected judges choose a winner from every geographic territory. The continent winners are being chosen from the regional winner in the second round, four winners from four continents, North America, Asia, Europe, and Australia. The judges in the final round choose the one comprehensive, worldwide winner to entitle as the “King of the Wrap World”. Nicky Caminiti was crowned the 2017 King of the Wrap World on November 1, 2017. The winner was publicly announced LIVE in the Avery Dennison Booth at the SEMA Show that took place in Las Vegas. Caminiti submitted a wrapped Volkswagen Beetle from 1963 and named the project “Lei’d Low”. His design defeated 169 submissions from 19 countries to win him the challenge. This was his second successive win and in 2016, his winning design was Toxic Rat. Caminiti declared that it was an amazing experience for him and his team to win this incredible wrap competition two years in a row. He also said that it had been an honor to participate in this challenge along with so many other talented wrappers across the globe that fought against him. According to him, Exotic Graphix would definitely be blasting through the wrap industry after such a success. Caminiti greatly appreciated the chance, created by Avery Dennison Graphics, for vehicle wrap installers to showcase their accomplishments in front of the whole world. Peter Wright, the technical marketing manager of Avery Dennison Graphics Solutions in the Australia & New Zealand region, who is also a judge of Wrap Like A King Challenge, declared that the regional and continental winners of 2017 challenge were highly professional with skilled talent. Choosing the global winner was a hard task and the inner had beaten the other contestants by a slim margin. All the other judges of this challenge, Molly Waters, Anders Pirates, Myles Kovacs, Jun Kinoshita, Justin Pate, Jurriaan de Vries, and, Stefan Ude thoroughly agreed with Wright. According to them, this year’s submissions and projects showed the very high standard of artwork that surely boosted the level of expectation from the related field for future talents among new wrap installers all around the world. Caminiti’s Exotic Graphix mentioned that they were inspired by cultural customs to create their project where they put emphasis on a theme that showcased a Hawaii-related surf theme. This woody theme displayed a three-dimensional effect with no actual wood. An arrangement of 100% vinyl coating was used for both outside and inside appearance of the vehicle. Some of the exclusive attributes included characteristic balanced wheels containing 3-D woody special effects, a steering wheel with Mother of Pearl wrap, a holographically coated brim, and several other wrapped decorative attachments. This unique piece of wrap installation by the “King of the Wrap World” 2018 took six hundred hours of craftsmanship by this team. The whole process was filmed into a 15-minute long documentary short film for demonstrating this particular wrap project to the world.